Before the Second World War, professional footballers’ contracts were limited to one year and there was a maximum wage in force. This prevented a wage war between clubs and ensured they were not lumbered with long-term costs for players they no longer wanted. It also meant every summer they was a set of new negotiations with players. In 1927, the whole of Swansea Town first-team refused to sign new contracts after the directors tried to lower their wages by a pound a week and make up for it by a bonus scheme based on the number of games played. The players stated they were objecting to the financial loss they would suffer if they were injured. They claimed they didn’t mind if they lost money if were dropped because of loss of form, although this was probably a sensible public statement to ensure they did not lose popular sympathy. In an act of solidarity, those first-team players who the change did not affect because they were already on lower wages, also refused to re-sign. The squad seems to have chosen its moment carefully making the decision the week before the club was due to leave for a tour of Portugal and Spain. Despite the strong position the players’ collective action put them in, they failed to secure what they wanted. The next day, the press reported that many of players had re-signed, although it was unclear on what terms. By the following day, only two players had not agreed terms. The club had held out and won. Once some of the players had broken ranks and signed the others were vulnerable. In the days of strict contract constraints, the only thing players had on their side was collective unity and that was not easy to achieve in the lower divisions where everyone was replaceable. Sources: South Wales Echo, 5-7 May 1927. Newsreels were shown at the cinema before the main feature. In the 50s and 60s, with little football on tv, they were most the common way for fans to see big clubs in action or the important away games of their own teams. In the days before extensive coaching networks, you could always advertise for new players. That’s what the Swans did in 1923 and here’s an ad the club placed in the Athletic News, a paper with close ties to the Football League, on 14 May 1923. In this era, clubs retained a player’s registration even if their contract had expired and they were no longer being paid. The ad thus asks about the transfer fee a player’s previous club might expect. In practice, not many clubs did retain players’ registrations and demand fees for players they were not paying. If word got around, that a club made it difficult for any player to move on after his contract expired, then finding new players might be difficult. This strange decaying home of Swansea Town and City for almost a century has seen great days and grim days; excitement and tedium; drama, tragedy, and more than a little farce. Some truly great football artists have graced the Vetch; but over the years a rather greater number of plodding artisans have plied their trade on the characteristically uneven, sloping playing surface. Occasionally the sun has shone; more often it seems to have rained. But throughout it all, the awkwardly positioned stands, banks, and terraces of the Vetch have served to create a very special sporting arena, where successive generations of supporters have given expression to the joys and despairs of following the fluctuating fortunes of ‘the Swans’. From time to time, the club has threatened to reconstruct the ground as a modern, well-appointed venue, but until recently the march of progress has somehow always been stubbornly resisted, as if the Vetch itself has delighted in its own downright oddness. Before the modern age of the purpose-built all-seater sporting stadia boasting corporate facilities, bars, restaurants, and conference suites, the establishment of football grounds in Britain was mostly unplanned and haphazard. Sites were acquired and cleared; then proper grass playing surfaces were created, together with small pavilions or wooden grandstands for the well-to-do; before, finally, rudimentary viewing facilities were provided for large numbers of working-class spectators in the form of raised ‘banks’. Early grounds thus evolved in piecemeal fashion, often coming into being in a matter of weeks and then evolving only very slowly over a number of decades. No more so was this the case than in Swansea where, in bold defiance of the basic laws of geometry and common sense, a football ground was somehow wedged awkwardly into the triangular communal space that represented the only large and open area of flat land anywhere near the centre of the town. By making a home for Swansea Town Association Football Club at the ‘Vetch Field’, the pre-First World War pioneers of professional football in Swansea created a sporting home whose physical location dictated that its architectural characteristics were thereafter to be defined by sharp angles, broken lines, and complete lack of any sense of symmetry. Indeed, there could be no greater contrast than between the chaotic jumble of the Vetch Field ground, and the clean shape, metallic shine, and perfect dimensions of the new home of the Swans built a couple of miles away at White Rock. It is, however, somehow appropriate that Swansea’s major football ground was created on a site squeezed between the County Jail, the Royal Arsenal, Hancock’s Brewery, and the Salvation Army Barracks, all of which were to provide various forms of comfort and services for several generations of Swans’ fans. At the same time, the fact that the Vetch Field was bordered by the terraced houses and back yards of Glamorgan Street, William Street, Gam Street, and Little Madoc Street meant that Swansea Town was almost literally carving out a place for itself at the very heart of the local community in the Sandfields area of the town. Again, there is a marked contrast with the new stadium which stands in splendid isolation on a reclaimed industrial wasteland on the banks of the River Tawe. The occupation by the Swans of the Vetch Field site meant that, whether for good or ill, soccer and the soccer ground were to form an integral part of the social fabric and landscape of Swansea. Consequently, as Swansea itself became the ‘ugly, lovely town’ of Dylan Thomas’s famous description, so too the Vetch Field in its own way became an ugly, lovely football ground. Cramped, misshapen, uncomfortable, and idiosyncratic, ‘the Vetch’ swiftly took on a unique character, which was reinforced by the early generations of supporters of the Swans who collectively gave powerful and passionate expression to an identity that was both local and very distinctively Welsh. In its early years, the community of fans who took up their Saturday residence at the Vetch Field gave vociferous backing to a team that certainly carried the hopes of the whole of Swansea, but which also was seen to be representing wider Wales. This ensured that from the very beginning the ‘Vetch experience’ brought together a rich mixture of very special ingredients to create a unique setting and atmosphere for ‘the dribbling code’ of football. For all the importance of 1912 in the history of the Swans, it is important to remember that association football was far from being new to the Vetch Field in September of that year when Swansea Town took to the field for the first time in a competitive fixture against Cardiff City. The game of ‘soccer’ as it was then universally known in South Wales had been played on the ground since the 1890s, but it was by no means a foregone conclusion that the Vetch Field would ever become a permanent home of the town’s first properly established major club. During the intervening years a number of clubs representing ‘Swansea’ had briefly flourished and died, and several of them had played their football elsewhere in the town. Indeed, if events had followed only a slightly different course then the modern-day football follower in Swansea might well be a supporter of a team called Swansea United who played their games at Danygraig or Morriston. This is not as far-fetched as it might seem, because at times between 1900 and 1910 the prospects of a professional football club ever making a permanent home for itself at the Vetch Field were virtually non-existent. Before the 1890s the Vetch Field might well have been a meadow sown with plants and vegetables, but it had recently become a wasteland where the town corporation dumped refuse and ash. Thereafter, however, a concerted effort was made to transform it into a sports or athletics ground. The local auctioneers Messrs Teague and Jenkins endeavoured to create an all-purpose sports ground, to be known as ‘The Swansea Central Athletic Ground’, which in keeping with the physical efficiency movement of the day, would be devoted throughout the year to the recreation of local young people. Teague and Jenkins enclosed the ground, levelled the field, built changing rooms, and laid out an inner cinder cycle track as well as an outer grass trotting track for horses. This enabled the Vetch Field to be used for a wide variety of sporting events such as cycle and foot races, and it hosted general ‘sports days’ on public holidays. But a wide variety of other general forms of entertainment was also provided for the people of Swansea. Fêtes and galas were regularly held at the ground, together with special events such as balloon ascents and boxing matches. Visiting circuses made the Vetch their temporary home, and during the early years of the twentieth century Buffalo Bill and his Indians camped out on the ground, thus, cynics might say, blazing a trail for the later generations of footballing clowns and cowboys who were sometimes to be found performing at the Vetch. The Vetch Field sports ground provided an arena for all forms of public entertainment, and when a newly formed Association Football Club was established in Swansea during early 1893 the soccer players who trained and played matches at the Vetch had to take their place alongside all manner of other sporting enthusiasts. This meant that games had to be played on a very poor playing surface, caused by the existence of the cinder cycle track which cut across the pitch in several places. Moreover, the popularity of the Rugby football on offer at St Helen’s ground meant that the fledgling Swansea club only attracted only very thin gatherings of spectators to the Vetch for games against teams such as Pembroke Dock, Brecon, Knighton, Carmarthen Training College, and the Second Battalion of the Devon Regiment. Poor public support and lack of substantial financial backing ensured that the club failed properly to establish itself at the Vetch. Although exhibition matches against Preston North End (played at St Helen’s) in 1894 and against Cup finalists Derby County in 1898 demonstrated that in the right circumstances soccer in the town could attract crowds of over 2,000, the 1890s were, overall, a time of failed hopes and ambitions for the team that took to the field wearing its very distinctive black-and-white hooped jerseys. In keeping with the early trials and tribulations of Swansea Association Football Club, the 1890s ended with the local corporation evicting the club from the Vetch Field. Rumours suggested that the ground was soon be built upon, and local people lamented the loss of the one and only open space in the heart of the town, but in the event the Vetch Field was sold to the Swansea Gaslight Company, and it began to use the site as a coal storage depot in support of its nearby gas works. The early link between the Vetch Field and soccer was not entirely broken, however, because the Gas Works team played Swansea and District League fixtures on the site, but the sale of the Vetch almost immediately sounded the death knell for the pioneering Swansea club. In August 1899 Swansea withdrew from the South Wales League ‘from the mere want of a ground’, as the South Wales Daily Post put it, and the club soon ceased to exist. For the next few years soccer continued to flourish at junior level in the town, but no club stepped forward to represent the whole town until 1906 when Swansea Town was formed. As with its predecessor, this club suffered because it could not find a permanent home, and it had to make do with playing its home games at Victoria Park, and it also had to withstand the challenge of the recently formed Swansea Villa who played at the same venue in the west end of town. Two years later, in 1908, yet another team stepped forward aspiring to represent the whole of the town, when East Side who played at Dan-y-graig adopted the name Swansea United and entered the South Wales Cup. With first Villa and then Town falling by the wayside, Swansea United were left to carry the flag, although it was Swansea & District XI teams that took the field at Dan-y-graig against Bristol Rovers in 1909 and Crystal Palace in 1910, and then at Morriston against Cardiff City in 1911. All of these games were lost by the local team, but the performances and crowds were encouraging, and a further effort was made to establish a first class soccer club in the town, with a view to it joining the English Southern League, which was then vigorously seeking to recruit new member clubs in South Wales. The size of both the town and its ‘healthy, virile’ local soccer league, which had 2,000 registered players in 1912, were such that it was widely agreed that Swansea was ideal territory in which to establish a professional football club, but the stumbling block remained the lack of a suitable ground. Indeed, the key to success for any professional soccer club in the town was said to depend ‘almost entirely upon the acquisition of a centrally and conveniently situated ground’, but in reality the options were very limited. The St Helen’s ground of Swansea RFC was considered to be an ‘impregnable citadel’, and only the Vetch Field had demonstrated in the past that it could accommodate crowds of any real size. With these factors uppermost in people’s minds, a new club and company was formed under the stewardship of Chairman J.W. Thorpe and Secretary S.B. Williams in the early summer of 1912. These two founding fathers of Swansea Town Association Football Club, together with an elected committee, organised the raising of the £2,000 share capital that was necessary to make the club financially viable, and they paved the way for the club’s election to the second division of the Southern League in time for the 1912-13 season. The aim was to bring together a squad of ‘imported professionals’ who would each be paid £3-£4 a week, and over the summer twelve experienced players were signed from league clubs in England, including the goalkeeper-manager Walter Whittaker who had previously played for Exeter City. Two Welsh amateurs were also signed, and it was one of them, Willie Messer, who gave the fledgling team its only personal connection with the town it was to represent. The early Swansea Town hardly drew at all on the local talent that supposedly existed in great abundance, but although the team was considered to be an ‘unknown quantity’ newspaper columnists were certain that it had the potential to capture high levels of support. In the early summer of 1912 hopes were also high that the ground problem could be solved, and negotiations took place with the Swansea Gaslight Company, which, quite fortuitously, had been refused permission to build on their Vetch Field storage yard. This enabled the Football Club to take out a seven-year lease on the Vetch Field in July 1912, with a view to clearing the site and preparing it in time for competitive Southern League action against Cardiff City just over a month later. Indeed, in the opinion of ‘Ajax’ writing in the Cambrian in August 1912 the football club had stolen an important lead on their rugby neighbours because the Vetch offered a much better location than the rugby ground: ‘It is situated right at the heart of the town – far more conveniently placed, in fact, as regards the railway stations than St Helen’s’. This offered the prospect of the club attracting large crowds, including those ‘rugbyites’ who were believed to have ‘gone over’ to soccer, having become disillusioned with the stodgy fare that had been served up in recent years by the All Whites. Finally, after almost a quarter of a century of false starts and setbacks, a professional football club was about to establish a permanent home for itself at the Vetch Field, a ground that seemed well positioned to attract sporting enthusiasts from near and far. Local newspaper headlines pointed to a ‘soccer boom’ occurring in Swansea during the summer of 1912, and J.W. Thorpe confidently predicted that the Swans would soon be serving up much better entertainment than that on offer down the road at St Helen’s. It was said that ‘bumper gates’ could be anticipated for the visit of clubs such as Leyton, Luton, Croydon Common, and Southend United, and some newspaper correspondents even began to offer over-optimistic speculation about whether there was much of a future for rugby in the town. The town that the professional players of Swansea Town Football Club stepped out onto the Vetch to represent in 1912 was described by the poet Edward Thomas as a ‘dirty witch’ of a town. Once Swansea had aspired to be the ‘Weymouth of Wales’, a genteel seaside resort town, and even as late as the 1920s, some older residents could recall the days when the town had been little more than an extended village opening out to the west on to green fields and meadows. But during the nineteenth century Swansea had in fact developed rapidly into something quite different and, although the surrounding area remained well known for its natural beauty, the town itself soon grew into an ugly sprawling metropolis, blighted by pollution and an industrial landscape that was deeply scarred by the after-effects of unregulated smelting, plating and mining activity. On the back of export-led copper, tinplate, and coal production, Swansea became a major industrial town linked to the British Empire and wider world through its large thriving port. In its wake, industrial and maritime growth brought rapid population expansion based upon sustained immigration from West and Mid Wales, the Welsh Marches, Devon and Cornwall, Ireland, and Mediterranean Europe, notably Italy. Swansea became a remarkably cosmopolitan town, with small transient communities of Chinese, Russian, and Polish labourers who sought work in the docks. Victorian expansion had brought wealth and prosperity to some sections ofSwansea society, but by the early twentieth century many people in the town still experienced a harsh working environment, centred upon unremitting hard and dangerous physical labour, and the rewards were often meagre. As a result, daily life was tough and living conditions were often very poor. This meant that out of sight of those who lived in the relative comfort of Brynmill and the Uplands in the west end of the town were countless slum dwellings crowded around the docks and wharves of the lower Tawe valley. Visitors to Swansea were often shocked by what they found in this part of the town, and as late as 1938 the noted Australian test cricketer Jack Fingleton wrote in his diary that ‘There could be nothing more gloomy than the walk I took through Swansea slum areas’, and he contrasted this scene with the ‘most glorious countryside imaginable’ that he found only a few miles away. Poverty and desperately poor social conditions co-existed with widespread drunkenness and lawlessness in parts of the town, and beneath a thin veneer of respectability Swansea was a boisterous and at times very violent place. As one American social observer noted during the early 1920s, ‘Before dark I took courage to go down what is called the Strand, where murders are said to be frequent. I saw more male and female wrecks of humanity, drunk and sober, with dirty children about them, than ever in my life.’ Policemen, he reported, ‘have orders never to come down here except in twos.’ He found that things were little different in the main part of town, and he wrote that ‘Up on the main streets every so often – and with increasing frequency as the evening grew – the crowd would gather to see a drunken brawl or to let the police trundle away on a two-wheeled stretcher some dead-drunk worker.’ It would seem that little has changed over the past eighty years or so. For many inhabitants of Swansea, life had a hard, abrasive edge to it, but the years around the First World War were also extremely fertile and creative in terms of the development of the town and local society. A strong sense of civic pride found architectural expression in buildings such as the Central Police Station (1912), the Exchange Building (1915) and the complex comprising the Guildhall, Brangwyn Hall, and law courts that was constructed during the early 1930s. At the same time, the need to entertain people in new and different ways saw the emergence of buildings and institutions dedicated to leisure activity. A host of theatres and music halls still competed for public attention during the 1920s, but they faced ferocious competition from the cinemas that were springing up in and around the centre of the town, and as if to herald a new era of sophisticated international entertainment the giant Plaza cinema on the Kingsway opened its doors for the first time in 1931. This was also a golden age for clubs and societies, as new hobbies such as cycling, rambling, and angling took hold of the imagination of those fortunate to have a little more time and money on their hands. Swansea was thus poised to change fast in the years after 1912, and by creating a professional club the directors of the Swans were swimming with a strong underlying current of enthusiasm for all things new and exciting. This enthusiasm was much in evidence on 7 September 1912 when Swansea Town, clad in all-white, played out a 1-1 draw against Cardiff City at the Vetch in a Southern League Second Division fixture. Around 8,000 spectators gathered to watch a game that was described in the Cambrian as ‘extremely exciting and full of incidents from start to finish, there being nothing in the Soccer code like the series of monotonous scrums which we see frequently in Rugby.’ The crowd was far larger than had ever been present at a soccer match in Swansea, and special ‘cars’ or trams ran to the ground from the railway stations in the town. But, despite the great sense of occasion, the club did not accommodate their new patrons in a degree of comfort. Indeed, a conscious decision had been made to invest in the playing staff and not the ground during the first season, with a view to establishing the team’s credentials in the eyes of the paying public. Mounds of ash and brick were used to create an ‘embankment’ for spectators around the entire pitch, but the site as a whole remained largely undeveloped. Indeed, the ground resembled the surface of the moon, an impression that was added to by the pitch itself, which had an ash and cinder surface. The players changed and put on their knee pads in a hastily constructed wooden ‘dressing room’, described as a ‘splendid pavilion’, but there were few other facilities of any note. It was only at the end of the first season, during which the Swans had played ‘clean and scientific soccer’, that the Vetch began to take proper shape as a football ground. As far as the players were concerned, the most important development in the summer of 1913 was undoubtedly the laying of a turf pitch, while general improvements were made to the spectator accommodation. Slightly higher raised banks were created, again from the conveniently available ash and stone, and a small thousand-seat covered and gabled wooden grandstand was built to run along the middle third of the south side of the pitch. Such a stand was deemed to be absolutely essential to the future of the club because it enabled gate income to be generated even when the weather was poor. Indeed, the need for such a facility was no better demonstrated than when the new stand was occupied by spectators for the first time in September 1913, and a 5-0 victory was recorded against Barry Town in a game played in a torrential downpour. This stand, which today forms the core section of the centre stand, was to house the directors, local dignitaries, many of the six hundred or so early members of the club, and the well-to-do occasional supporters who almost all sported the then-fashionable homburg hats and boaters. These seated spectators, who from the early days included a sprinkling of women, gained access to the ground from Glamorgan Street, and then found their way to their bench seats, via steps at either end of the stand. The rest of the spectators, who almost universally wore flat caps, paid 6d. for admission through small gates in the corners of the ground, and they then took up position on the banks wherever they chose. They were kept off the pitch by low walls and iron railing fences, and in a few places they were afforded the luxury of resting up against a metal ‘crush barrier’. The early development of the Vetch enabled more spectators to attend games, and the success of the Swans in the 1913/14 season led to crowds for Southern League matches climbing to over 12,000. As was to become the norm, however, the greatest public excitement was reserved for the FA Cup, which the club entered for the first time, and games against Merthyr and Queen’s Park Rangers (a 2-1 defeat in the last thirty-two), attracted attendances of 18,000, including those who came into the town on special trains from outlying districts. This early outbreak of cup fever was only slightly reduced by the outbreak of the First World War in August 1914, and when six months later the Swans were drawn against Blackburn Rovers, the Football League Champions, the match was played out in front of some16,000 spectators. In terms of the opposition, if not the size of the crowd, this was by far the biggest game in the fledgling club’s brief history, and it became all the more notable for a heroic backs-to-the-wall 1-0 victory, secured through a spectacular winning goal scored by Ben Beynon, who had only a year earlier had been turning out for the ‘All-whites’ at St. Helen’s. The result was described as a ‘staggerer’ by one reporter, and it was said that whole sporting world was taken by surprise. Certainly the Swansea fans could not contain their excitement. As the Daily Post reported, ‘When the referee blew his whistle for the cessation of the game there were scenes of great jubilation. The crowd jumped over the railings and rushed towards the Swansea players, who they shook by the hands and congratulated upon the success. [Jack] Duffy was carried back to the pavilion where a dense crowd congregated and patted the players on the back as they went back to the dressing room. Cheer after cheer was raised for the Swans.’ The fans even celebrated by singing their own triumphal song, but sadly the joy was short-lived and the cup run came to abrupt end a couple of weeks later with a 2-0 defeat against Newcastle United, after a draw on Tyneside. The fact that the club was now rubbing shoulders with the likes of Blackburn and Newcastle demonstrated that it had come a very long way in a short space of time, but the bright spark lit by the cup run of 1915 was almost extinguished during the remaining years of the war. Organised league football came to an end in 1915, and, deprived of regular gate income, the club survived on a hand-to-mouth basis by hosting charity and exhibition matches. The side of 1915 broke up, and the prospects for the club were far from rosy at the return of peace in 1918, when there was considerable uncertainty about the future leasing of the Vetch Field from the Gaslight Company. In the event, the lease was renewed, together with hope for the future, and local interest in the Swans was quickly restored in 1919-20, not least perhaps because reasonable success on the field in the first division of the Southern League was based upon the inclusion of a far greater number of Welshman in the side. By the end of the season, the general post-war enthusiasm for sport and public entertainment ensured that attendances reached a healthy 15 to 20,000. The interwar fortunes of the Swans were very similar to those of the local economy: initial enthusiasm was followed by a great boom, before the onset of a lingering depression that was only occasionally punctuated by good news. In May 1920 moves to expand the size of the English Football League saw the Swans become associate members of the League, and they entered the newly created Division Three. Under the astute stewardship of Joe Bradshaw (who without doubt was one of the best two or three managers that the Swans have ever had), and with a crop of good signings such as Wilfie Milne and Jack Fowler who became Swansea legends, the early 1920s saw the club make good progress on the field. This culminated in 1924/5 when the Swans pipped arch-rivals Plymouth Argyle to the Third Division (South) Championship, clinching the title on the last day of season in front of 25,000 spectators at the Vetch. Such was the crush inside the ground on that tumultuous occasion that the crowd was reported to have ‘got used to seeing ambulance men scuttle across the ground in response to a shriek of pain from some of the spectators or the fainting gasps of some half-suffocated man.’ At the end of the game ‘the pent up enthusiasm of the lusty lunged multitude broke loose in one great convulsive roar. The crowd leaped over the barriers like a sheet of water breaking its banks. The parched ground sent up clouds of dust as the cheering, gesticulating, and joy-maddened mob raced after their fleeing heroes.’ When the players eventually escaped from the dressing room, they were carried away in triumph in a charabanc, which proceeded through teeming crowds at walking pace behind the multi-talented members of the St John’s Ambulance Band who by now abandoned their stretchers in favour of musical instruments. As was fast becoming traditional, the FA Cup also consistently led to attendances of over 20,000 packing into the ground to watch the Swans take on high-profile teams such as West Ham and an Arsenal side led by the legendary Charlie Buchan. Fortunes peaked in 1925/6 with an ‘annus Swanus mirabilis’ when the team almost pulled off a remarkable cup and promotion double. Having defeated Arsenal 2-1, Swansea reached the semi-final of the FA Cup for the first time, disappointingly bowing out 3-0 to Bolton Wanderers at White Hart Lane, and a highly promising league campaign only fizzled out towards the very end, leaving the club in a highly creditable fifth position. At the end of 1926, Swansea Town was on the verge of becoming a major club with a substantial following. Alas, and as was to happen several times in the future, the club was unable to build on these firm foundations, and things were not helped by the untimely departure of Bradshaw. Occasionally during the late-1920s the Swans put together a decent run in the league, and the FA Cup still provided good crowds and great entertainment, but gradually an ageing side reached the end of its days. Inadequate replacements were brought in for the team that had won promotion to Division Two in 1925, and the club became embroiled in a perpetual battle against relegation, not least because away form was consistently awful during the 1930s. There were occasional shafts of bright light, such as the 35 goals scored by Cyril Pearce in season 1931/2, but, against a background of acute economic depression, the crowds fell away, and when Pearce scored his last two goals in a 2-0 victory against Bury in May 1932 the attendance at the Vetch was a mere 4,281. Until 1926/7 crowds had been higher than the divisional average, but thereafter they were always below the line. Whereas during the 1920s league attendances averaged 13,334, they slumped to 9,785 in the decade that followed. Clearly the onset of mass unemployment was a major factor in this worrying decline, but the fare served up was often uninspiring compared with the entertainment that had been on offer during the early 1920s, and for much of the time all that local soccer enthusiasts had to look forward to was the arrival at the Vetch of a parade of traditionally strong teams such as Everton, Bolton, Aston Villa, Tottenham, and Burnley who had temporarily fallen from the heights of Division One. These sides all had their stars, and thus during the 1930s Swansea crowds were transfixed by the presence at the Vetch of many present and future stars of the game: Dixie Dean of Everton, Ted Drake of Southampton, Tommy Lawton of Burnley, Frank Swift of Manchester City, and Stanley Matthews of Stoke City. An interest in these ‘national’ football icons helped to keep the soccer flame burning in Swansea at a time when the fortunes of the All Whites and the Welsh rugby team were beginning to recover after some very lean years. It was against this general playing background that the Vetch Field was developed and then stagnated as a football ground during the inter-war years. At times, money was extremely tight for the Swans, and the Board did well to avoid the fate of the former FA Cup winners and First division members Cardiff City who slumped to the bottom of Division Three, and of Aberdare Athletic, Merthyr, and Newport County who fell out of the Football League, although the County regained their place after a year’s absence. But conditions on and off the field were hardly conducive to a sustained programme of stadium development and the ground as a whole only took half a step forward. During the mid-1920s some noises were made about eventually increasing ground capacity to almost 60,000 but, despite confident pronouncements about the future, there does not appear to have been any realistic or affordable scheme properly to upgrade the ground. As result, the Vetch Field was only improved in stages, one side at a time, as resources became available. And, as time went on, the shape and size of the physical environment became more and more of a constraining factor. The pitch itself simply could not be positioned parallel to the surrounding streets, and this meant that two of the banks could not be extended properly along the full side of the playing surface. As a result, in two of the corners neighbouring back gardens came to within a few feet of the pitch, and both the East Bank and the main Bank had to be tapered sharply at one end. This gave the Vetch Field its unusual lop-sided appearance, and no matter what improvements were made the ground was always to look as though a square peg had been forced into a triangular hole. Of necessity, the playing surface was quite small and narrow, with the touchlines always close to the spectators, and from the beginning this gave the ground its characteristically ‘tight’ feeling. As a result, the taking of a corner kick was never easy at the Vetch. By the standards of the time, the pitch was considered to be a reasonably good one and because of sandy subsoil it was quick-draining, which meant that very few games ever had to be postponed. Having said that, the pitch suffered from extensive use, and well over eighty games a season must have been played on it. In addition to first-team league and cup fixtures, the reserves played games in the Welsh League and the London Combination League, and the ground also hosted schoolboy soccer, local cup finals, and occasional internationals. Long-serving groundsman George Hart did his best, but his methods seem to have been fairly basic and typical of their time. In the summer of 1927 it was said that the pitch had been ‘given over to sheep grazing’ which ‘has had a fine tonic effect.’ Nevertheless, by the mid-point of any season the pitch was often almost threadbare and entirely grassless, especially down the middle. As a result, it became a dustbowl during fine weather, while heavy rain created a mud bath which often reduced games to a lottery. This was very much the case in February 1936 when Bradford City visited the Vetch, although Swansea supporters were not complaining too much when their team took advantage of atrocious conditions to register a record 8-1 victory. In terms of architecture, the first stage of the interwar ground development saw the main stand extended in the summer of 1920 so that it ran the whole length of the pitch. The initial aim had been to extend the stand towards Richardson Street, beneath the towering Drill Hall that had replaced the Royal Arsenal, and it was anticipated that this would create 3,000 extra seats. In the event, however, the original wooden stand was extended outwards in both directions, creating what became the ‘Wing Stand’ (which still has its original bench-style seating) at the Town End, and the Richardson Street terraced enclosure (now the ‘Family Stand’), which curved round slightly to meet the West End of the ground. Entrance to the main seating area of the stand was through a very narrow alley way between two houses (now the players’ entrance), and teams emerged on to the ground down steps through an opening at the half-way line, where the current director’s box is situated. The structure remained at this stage a very rudimentary one, and little had been built up by way of office or social facilities either beneath or behind the stand. To the right of the main stand was the East Bank, an ash and shale bank which remained largely unaltered. Railway sleepers were added to the lower section to create a terracing effect and, as Tom Kiley later recalled of his time on the junior playing staff, one of the painful close season tasks of younger players was to dig out the old worn sleepers and replace them with new ones. The main Bank was raised and deepened at this time, essentially by adding more rocks, ash, and shale to the middle section of the existing mound that ran along the north side of the pitch. Space was tight at the west end of the Bank because of the proximity of houses in Little Madoc Street, but growth and an expansion of standing capacity was made possible in the Summer of 1925 by the demolition of the Vetch Field School, which had temporarily occupied a corner of the site. Again, railway sleepers were added to the lower part of the bank, but critics still complained that work had been left unfinished, and the upper section remained little more than an ash heap, so much so that the ground as a whole was still being described as a ‘rubble heap’. Certainly, standing on the main popular bank (which was not yet known as the North Bank) offered little by way of comfort or protection from the elements. The steepness of the upper part of the Bank was painful on the ankles, and older supporters have vivid recollections of heavy rain causing torrents of dirty water to cascade down from the top, which meant that they often left games with their shoes or boots covered in grime and their pockets full of water. Indeed, conditions were such that foul weather deterred people from attending games, and in 1921 a torrential pre-match downpour meant that when the fixture against Millwall kicked off there were only around 200 spectators standing on the main bank. But despite much evidence that poor weather knocked several thousand off the gate, it seems that at this stage no thought was ever given to providing cover for those who stood on the ‘popular side’. Indeed, those on the main Bank were provided with little other than an opportunity to find a good spot from which to watch the match. Access to the Bank was still from the sides, although brave souls wanting a quick escape at the end of the game, could go ‘over the top’ at the back and scramble down the shale in the manner of a fell runner or mountaineer. Without doubt, the greatest architectural advance in the ground came at the Western End which backed out on to Richardson Street, albeit once more at an awkward angle. This too had been a shale bank, but in the summer of 1927 it was completely redeveloped as a two-tier structure, with a lower concrete terrace and an upper wooden seated area. The West stand, or ‘Double-Decker’ as it soon became known, was to accommodate 4,000 standing spectators, the majority under cover, and just over 2,000 seated spectators. One supporter recalls the new stand being regarded at the time as ‘the eighth wonder of the world’, not least because it gave the seated spectators in the upper tier a high, panoramic, and uninterrupted view of the pitch. Cushions could be hired to soften the effects of hard wooden benches, and from the beginning spectators marked their applause by rhythmically banging their feet up and down on the wooden floor. Quite what effect this initially had on those underneath remains unrecorded, but the gradual opening of the new stand coincided with remarkable sequence of goal scoring. The upper section of the stand was not ready for occupancy by the time of the first game of the 1927/8 season but those who stood on the lower terrace saw a 2-1 victory over Fulham. A few days later a handful of spectators were allowed to climb the stairs to the upper level for the first time, and they were ‘sent soaring up to the highest flights of ecstasy’ by a 5-3 win against Manchester City. The full opening of all parts of the stand on 17 September was marked by a 6-0 demolition of Wolves, and the next home game saw a further six goals put past South Shields. This frenzy of scoring, including four hat-tricks, can be attributed to the introduction of a new offside law which seems to have completely bamboozled defenders for a short time, but it was still quite a way to mark the opening of the Vetch’s new landmark grandstand. The opening of the ‘Double-Decker’ in 1927 can be seen to have marked the high-water point for the development of the ground and, apart from an upgrade to the North Bank, things at the Vetch were to remain much the same for the next thirty years or so. Only few cosmetic improvements were made to the internal fabric of the ground, and most notably the addition of the ‘Glamtax’ half-time scoreboard in the north-east corner of the ground helped to provide spectators with the state of play in other games. This telegraph-style scoreboard was in place by the late-1920s, and changes to the teams announced in the printed programme were conveyed to spectators via messages scrawled on chalk boards carried around the edge of the pitch. A rudimentary public address system came into being in order to broadcast music from records, but the tunes could only be heard and identified by those situated right next to the loudspeakers situated in the main stand. Consequently, throughout the interwar period it was customary for pre-match and half-time entertainment for the masses to be provided by bands who offered a staple diet of popular marching tunes. Otherwise, the facilities remained basic. There were a couple of small tea bars dotted around the ground, but those wishing for refreshment had to wait the arrival of boys who carried tea urns or trays of sweets, nuts, and the inevitable packets of Woodbines and Players cigarettes. Such was the prevalence of smoking at the time that the smell of cigarettes always wafted across the ground, and from time to time spectators swigged from flagons of beer that were carried into the ground. Most of all, of course, the crowd wished to be sustained by the quality of the football on offer, and it was this rather than the nature of their surroundings that primarily determined their collective mood and behaviour. Don’t think your team is the only one that can play a clever game. There are others. Don’t desert your team when they strike a bad patch. That’s when they want your encouragement most. Don’t blame the referee for your defeats. Take them as men. Don’t go to see one team only play. It takes two sides to provide your sport. Give them both a share of your cheering. These instructions can be regarded as a somewhat patronising attempt by the respectable classes to impose their own standards of decency upon unruly proletarian elements, but in fact the crowds at the Vetch for the most part seem to have been well behaved. The crowd certainly gave vociferous backing to their heroes, and in 1926 it was said that ‘ordinarily the cheering can be heard as far as Fforestfach’, which was no mean feat even before the age of heavy noise pollution. Those on the main Bank seem to have required little encouragement to strike up a song, and they often ran through a medley of popular hits and hymns, many of which were sung in Welsh. Thus the crowd often burst into spontaneous renditions of ‘Cwm Rhondda’, ‘Mae Hen Wlad Fy Nhadau’, ‘Sospan fach’, and ‘Yn y Dyfroedd Mawr a’r Tonnau’. When a visiting Stoke City supporter was told that the last hymn was usually heard at funerals, he looked shocked and then replied ‘If that is so, then we had better hum “Show me the way to go home.”’ The enthusiastic singing of such hymns and arias certainly gave a distinctive Welsh feel to big games at the Vetch, but while the crowd were giving vocal expression to a form of Welshness they cannot be said to have used the game of football to make any wider or deeper political points about nationalism or national identity. Most were only ninety-minute nationalists, and they simply enjoyed participating in mass community singing. The crowd took up English-language popular tunes with equal enthusiasm, especially in the case of ‘I’m forever blowing bubbles’ and ‘Danny Boy’. Indeed, with just a little creative imagination a hit song was soon adapted to celebrate the scoring prowess of Jack Fowler, and ‘Chick, chick, chick, chick, chicken, lay a little egg for me’ was reworded to become ‘Fow, Fow, Fow, Fow, Fowler, score a little goal for me, We haven’t had a goal since the last match and now it’s half past three’. Tapping into this crowd participation, the club often encouraged the Vetch voices to stretch their musical chords even further. At the Bury FA Cup tie in 1927 mass singing was organised at a game in Wales for the first time when the conductor Thomas Radcliffe was sponsored by the Daily Express to lead the crowd through a repertoire of popular numbers. The ground, it was said, ‘blossomed into song’, and ‘the harmony and melody of community singing rose on the fog-laden air.’ Later, records were played over the PA system in order to get the crowd going, although this did not always have the desired effect. At the Portsmouth Cup tie of 1934 hit tunes were played ‘but a big section of the crowd preferred Welsh hymns and particularly “Cwm Rhondda”’. Following the same game, a reporter also wondered about the wisdom of playing the doleful hymn ‘O God our help in ages past’ just moments after Portsmouth had scored what proved to be the winning goal. Singing gave people a sense of full involvement in the occasion, but in their excitement they also swayed from side-to-side together in unison. This was unnerving for some in packed crowds, and the practice was considered dangerous by the authorities, but little could be done to stop it. To prevent crushing, small boys were moved to the front ranks of the banks and terraces, and during big games spectators sat on the very edge of the pitch. There was little by way of any official stewarding, but on major occasions ‘packers in’ were used to move the crowd toward the centre of the banks and megaphone-wielding policemen loudly encouraged people to stand as tightly together as possible. They did this in the belief that such a strategy offered the best countermeasure against surges, but this seems now to have been a somewhat dubious practice and on occasions the club managed only narrowly to avoid serious accidents in the ground. ‘Rolande’ wrote in the Sporting News that when the Swans scored against Aston Villa in the Cup in 1925 ‘the spectators [in a crowd of almost 20,000] rose as one person and for a moment one trembled to think what might happen to the barriers at the Mumbles End.’ Nine years later a then record attendance of 27,910 packed into the Vetch to watch a cup tie against Portsmouth, and such was the demand for admission that it was said that the club needed a ground that was twice the size. The crowd were repeatedly encouraged to ‘close up’ but the effect of this was such that at one point before kick off workmen were called in to hammer in wooden battens to support the fencing that surrounded the pitch. This had little effect, however, and ten minutes into the game a barrier gave way at the ‘Wind Street End’ of the ground and dozens of people spilled out on to the pitch, causing the game halted. Fortunately no-one was injured, but then the front section of the Richardson Street Enclosure collapsed, although again, miraculously, no-one was hurt. It is evident that big games attracted large support for the Swans from within the town and immediate district, but they also drew in large numbers of spectators from further a field and this serves as a useful reminder that in those days the club days possessed a very large catchment area, which for a variety of social, economic, and cultural factors has since been lost. When Cup games were made ‘all-ticket’ there were howls of protest from ‘Valleyites’ who complained that they were being denied access because they could not comply with the club’s rule that they must apply in person for tickets. As this suggests, there were plenty of people from across South and West Wales who were prepared to travel to Swansea for major games, and this demonstrates how the club acted as a vehicle for wider Welsh sporting enthusiasms and identities. The really special occasions could even attract substantial interest from neutrals beyond Wales. This happened most notably perhaps in 1926 when Arsenal came to town for the FA Cup Quarter Final. On that day in March nineteen special trains ran to bring in supporters from near and far. It was reported that ‘advance guards’ of general football enthusiasts came in from Ireland, Lancashire, Yorkshire, Cornwall, and London, and observers noted the great variety of accents that could be heard in the huge crowds that thronged the streets around the Vetch from the early morning of the game. But the South Wales Daily Post also noted that that this was ‘essentially a Welsh day. North and South Wales poured enthusiasts into the town.’ Six Great Western Trains brought in fans from all over the South Wales coalfield, and football specials ran from places such as Llandovery, Craven Arms, Brynamman, Ystalyfera, Newport, and even Cardiff. This was akin to a full-scale military-style mobilisation of Welsh support for the Swans, and it is not surprising that the official attendance reached 25,158, with the Arsenal supporters said to be outnumbered by fifty to one. By the time Portsmouth arrived for a cup-tie eight years later, in 1934, different patterns of supporter transportation had begun to emerge. A significant number of ‘football special’ trains were still laid on for this important occasion, but plans also had to be made to cope with the influx into the town from outlying areas of a large number of cars and motor vehicles. The AA put up ‘to the match’ signs at all the approaches to the ground, and khaki-clad officers were on duty to direct the traffic. At the end of games such as the Portsmouth Cup tie, a great tide of humanity surged back out of the ground into the centre of the town. Oxford Street was routinely brought to a standstill, and the massed ranks of supporters hurrying to cafes, pubs, and transport gave way to nothing other than the trams that continued to operate until 1937. On big match days the town in general could not help but be swept up and carried along on this general tide of enthusiasm. Large crowds gathered at High Street Station to greet visiting teams, and the recently relegated Aston Villa attracted much attention prior to the first game of the 1936/7 when they arrived in a specially chartered one-carriage diesel train. People camped out for hours in the streets around the ground prior to big games, and it was reported that on the evening before the Arsenal game of 1926 ‘enthusiasts’ knocked on the doors of local houses and made ‘extraordinary offers’ in the hope that they might be able to spend the night on the sofa. On several such occasions the ground could simply not cope with such demand for access, but it was nevertheless said that when ‘sold out’ signs were put up those locked outside the big games managed to behave in a ‘commendable manner’. Several thousand ticketless hopefuls were still outside the ground when the gates were closed before the Portsmouth cup tie of 1934 and, although some hung around hoping for late entry, a large percentage of them were said to have gone away in good order to watch the All-whites playing at St Helen’s. Success gave a healthy boost to local pride and it also was thought to enhance the profile of the town, not least in the long-running battle for civic supremacy that existed between Swansea and Cardiff. More broadly, as the Daily Post put it in 1926, any major footballing victory for the Swans meant that ‘Indirectly the town benefits for there is nothing like sporting eminence to advertise a locality, and the geographical diffusion of interest of an association team is necessarily much wider than can be hoped for with Rugby.’ Rather more prosaically, success on the pitch helped to give a much-needed shot in the arm to local business. For big matches, licensing hours were extended so that thousands of thirsts could be quenched before and after the game, and small entrepreneurs tried to cash in on the influx of supporters. Around the Vetch all manner of favours, streamers, and rosettes were sold, and greengrocers must have done a roaring trade given the large number of giant leeks that were always in evidence at big games. Indeed, it became something of a tradition for a spectator or two to run onto the pitch prior to kick off in order to tie a leek to a goalpost. Before the Stoke cup tie of 1926 those queuing for entry to the ground ‘were serenaded by a number of street musicians, banjoists, and a male quartet’, and by the time the supporters went through the turnstiles most were wearing recently purchased miniature Swans in their hats. Harry Secombe declared that he had little interest in soccer although he was often to be found standing on the West Terrace. Indeed he eventually became the founding President of the junior supporters club, and prior to the FA cup tie against Arsenal in 1968 he sent a telegram to the club offering himself as a goalkeeper in the belief that he was by then so large that no one could possibly score a goal past him. He recalled that during the 1930s the club built higher and higher fences around the Vetch in order to prevent onlookers having a view of the game. The building of private stands had become a matter for great concern to the club, especially in view of its own straitened financial circumstances, and in 1935 it was reported that a woman who owned a house in Madoc Street had constructed one capable of holding 35 people, each of whom paid one shilling for a ticket to watch a match. This budding female entrepreneur was eventually taken to court by the Customs and Excise on the grounds that she was not paying entertainment tax on the profits she made from this enterprise. Of course, not all games generated large crowds and a positive atmosphere, and these years should not be viewed through rose-tinted spectacles as though they now represent some sort of golden age when everyone behaved themselves, threw their hats in the air when goals were scored, and gave three rousing Welsh cheers to both sides. At a time when life was harsh and popular protest was common, it is hardly surprising to find that crowds often gave loud and robust expression to their frustrations. Indeed, some sections of the crowd became a constant cause of concern to the authorities. These so-called ‘unruly elements’ generally did not direct their anger at either the opposition or its supporters, but instead they vented their anger at the shortcomings of the home team and, especially, the referee. From the very beginning, appeals had to be made for the crowd not to resort to heckling and barracking the Swansea players, but these seem to have fallen on deaf ears and the problem seems to have become acute after the First World War. Calls were made for stewards to step in to prevent fans shouting abuse or ‘hurling epithets’ at players who were trying their best, and it was hoped that the club would get rid of a ‘small sprinkling of roughs’. It was of course wholly unrealistic to think that people could be expected to control their emotions and keep quiet, and an undercurrent of barracking was to continue throughout the interwar period. It was not always tolerated, however, as ten-year old John Conibear found out to his cost when he shouted abuse at a Manchester United player and then swiftly received a clout round the back of the head from a complete stranger who was standing next to him. On the whole, however, any aggression in the ground remained of the verbal type, and there seems to have been no fighting or tribal conflict within the crowd. Certainly the press reported no major incidents of crowd ‘trouble’, or perhaps they chose to turn a blind eye to episodes of misbehaviour in the hope that they could prevent copycat actions from impressionable youths. Very occasionally, some missile throwing occurred and it is known that in 1934 a referee at the Vetch was pelted with oranges by those who were upset by his performance. Rather more seriously, John Conibear has a vivid recollection of the well-attended Swansea-Bolton game of April 1935 when the referee was hit on the knee by a rock or half-brick thrown at him from the East Bank. Fortunately for Mr E.C. Carnwell of Lichfield the damage was slight and he was able to carry on, but the general mood of the crowd is perhaps best summed up by the fact that the offender was immediately apprehended by those around him. He was charged and later convicted of a public order offence, and it is telling that most people in the ground that day were truly appalled by an event they considered as being entirely untypical of the general Vetch experience of the time. Most supporters paid for entry to the ground on a match-by-match basis, although it was reported that during the years of greatest hardship there were always crowds of boys and unemployed men clustered around the turnstiles hoping for free admission. If they did not manage to dodge, force, or climb their way into the ground, they were at least guaranteed entry for the last fifteen minutes when the gates were thrown open ready to let the crowd. Interwar admission prices stabilised at 1 shilling for ‘Field’ (or Bank) entry for adults, and 6d for boys. A seat in the Main Stand cost 3 shillings, and the seats in the Double Decker stand were priced at 2s 6d, although the entertainment tax introduced during the 1930s added a little more to the cost of entry. A considerable number of supporters strengthened their commitment to the Swans by becoming ‘members’ or season-ticket holders at the Vetch. Broadly speaking, their numbers fluctuated in line with average attendances and while there were 1,131 members in 1926/7 there were less than 400 in the doldrums year of 1931/2. These people formed the core of the support that gathered at the Vetch, and many of them organised themselves into a very active supporters’ club. Of course, following the Swans was the main point and purpose of the supporters’ club, and excursions were organised to away games. Trips to games in London were especially popular, and trains were timed to depart from Swansea very late on a Friday evening so that people could arrive at Paddington early on the Saturday morning and enjoy a good few of hours sight-seeing before making their way to the game at Fulham, Q.P.R., or wherever. As a reflection of the times, the excursions to London also allowed supporters the opportunity to visit the Cenotaph where they could honour the memory of friends and comrades who had fallen in the war. But the supporters’ club also organised a wide variety of social events such as dances, ‘smoking concerts’, and fund-raising shows, while the close season saw bowls and cricket matches, together with picnic excursions to Gower beaches and beauty spots. Rather more ambitiously, the supporters club organised holiday trips to the continent. In August 1927, after the Swans had returned from a month-long visit to Spain and Portugal during which Real Madrid had been beaten 3-0, a large group of supporters left Swansea for a 10-day holiday in Belgium. A party of 150 headed for Ostend and Brussels to follow an itinerary that included what must have been an extremely poignant charabanc tours to the First World War battlefields. Clearly the Vetch Field lay at the heart of an extended social network that brought together people who were happy to spend much of their leisure time in the company of other supporters. As a result, a substantial community of fans came together for rather more than ninety minutes of footballing action on a Saturday afternoon. While the interwar Vetch Field was home to the Swans and its supporters, it should not be forgotten that the ground also hosted other teams and indeed other events. Several high-profile boxing bouts featured local stars such as Len Beynon, Ronnie James, and Jim Wilde who fought Tommy Farr for the Welsh Heavyweight Championship before Farr went on to pit his skills against the legendary Joe Louis. Wales played three international soccer fixtures at the Vetch between 1919 and 1939, but they did not draw in the crowds in anything like the numbers that attended FA Cup ties involving the Swans. Indeed, in 1925 a crowd of only 8,000 watched Wales lose 2-1 to England, even though the Swansea goal-scoring hero Jack Fowler was awarded his first cap in what might have been a calculated attempt by the FAW to draw local spectators to the game. A much greater level of public support was evident for some schoolboy internationals, however, especially when the Swansea district provided a good proportion of the team. In 1935 six local lads lined up for Wales against Ireland, and their 5-1 victory was watched by a 16,000 crowd ‘including small boys with gigantic leeks that almost obscured their view.’ No doubt the size of this midweek crowd was determined by the fact that pupils were let out of school for the afternoon, but the town had already developed a voracious appetite for schoolboy football. Under the expert direction of Dai Beynon, who cultivated several generations of top-quality players, Swansea Schools had embarked on a crusade to capture the English Schools Shield. They lost in the final in both 1934 and 1935, on the latter occasion to Manchester Schools at the Vetch, but it was a case of third time lucky and in May1939 they finally lifted the Shield for the first time by beating Chesterfield 2-1 in front of a home crowd of 20,000. The Swansea Schools victory of 1939 gave the town’s football supporters a tantalising glimpse of a very bright future, but realisation of the enormous potential of the vintage crop of local players had to be postponed because of the outbreak of war a few months later. On 2 September 1939 the reserves were in action at the Vetch and the depressing news filtered back to the crowd that the first-team had lost 8-1 away at Newcastle. This was put into perspective somewhat the following day when war was declared, but it was still not the best way to bring down the curtain for six years on league football at the Vetch. Shortly afterwards, the military authorities took possession of the ground and Bill Woolway recalls that a trench was dug in the Main Bank to house anti-aircraft guns. Fortunately, the ground avoided the devastation that the Luftwaffe inflicted on much of the town centre, especially during the ‘Three Night’s Blitz’ of February 1941, but rumours long circulated that the Vetch was used as a central point to which the authorities carried the bodies of those killed in the bombing. Whatever the truth of this claim, the Swans were denied residence at the Vetch Field between 1939 and 1942, and they were obliged to play fixtures at St Helen’s. The club returned to their home in time to take part in a ‘League West’ competition during the 1942/3 season. This involved sides such as Cardiff City and Bristol City, as well as lesser lights such as Bath City, Aberaman Athletic, and Lovell’s Athletic, and the aim was to give the sport-starved public some competitive action. This served its purpose and, in the absence of men who were away with the services, the wartime games also offered opportunities to budding local stars, the most outstanding of whom proved to be Trevor Ford, who made a more than adequate switch from full-back to centre-forward. Today, it’s fairly easy to see the highlights of Swans’ games. There’s the internet and, if even if you don’t mind waiting until the end of the show, Match of Day. But even just a few years ago it wasn’t that easy. Then it was a case of waiting for that show beloved of all Swansea fans Soccer Sunday. Go even further back and there are many away goals that just a handful of Swans fans saw. One way to see the goals was at the cinema where they sometimes featured as part of the Newsreel items that preceded the main film. Here’s an ad from 1925 advertising the highlights from a match against Stoke. Before it became purchase to buy replica shirts and official merchandise in the 1980s, fans used to make their own ways of displaying support for the Swans. As far back as the 1920s, this involved making ‘favours’ (rosettes or ribbons) or even wearing leeks. We’ve had one home-made rosette from the 1960s donated to the project. It’s a little faded but it was very carefully made, perhaps with some help from Mum for the embroidery? Mothers, grandmothers and aunties were also employed into knitting many a black and white scarf. Even after official merchandise became available, fans liked to make their own and the development of cheap printing for t-shirts allowed the imagination to be set free. 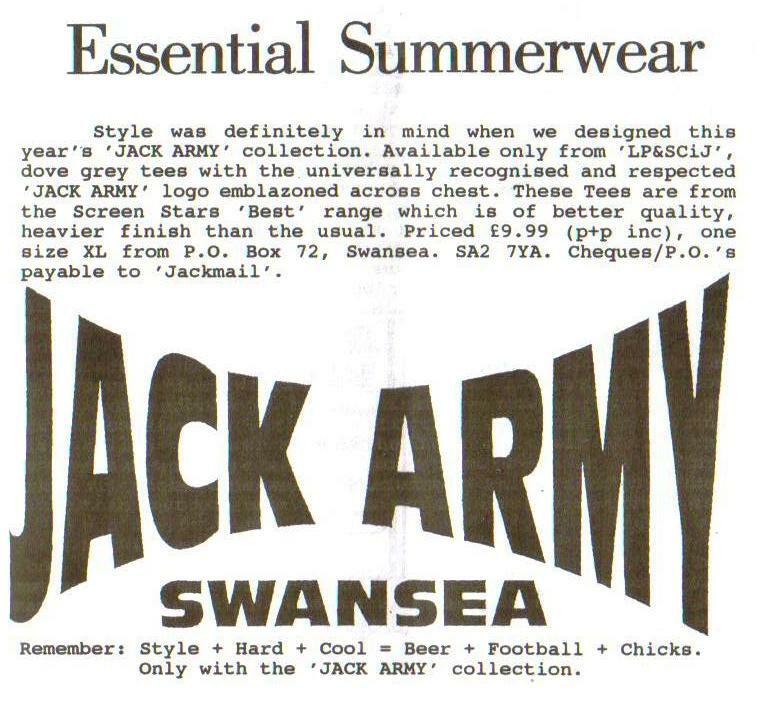 Many t-shirts took on the style of concert tour shirts, listing the away games that the Jack Army was visiting in their annual tour of English football grounds. These t-shirts were all part of the close links that developed in the 1980s between fashion and following football. Labels mattered, being cool mattered, wearing the right gear mattered. Sometimes this was a little tongue in cheek but sometimes it was deadly serious. Here’s a great ad for T-shirts from the Love, Peace and Swansea City fanzine, issue 6 May 1993. In May-June 1927 the Swans undertook a tour to Spain, and also played games in Lisbon and Paris on the way home. The tour was a great pioneering venture, but it was undertaken against a background in which the majority of the first team squad had refused the contract terms offered by the club for the following season. 19 May v Spanish Army in Madrid. Lost 2-3. 22 May v Bilbao in Bilbao. Won 2-1. 26 May v Motherwell in Barcelona. Lost 0-1. 29 May v Catalonia Athletic in Barcelona. Won 2-1. The game against Catalonia was the first occasion on which a British team had won in Barcelona. It is also worth noting that the Swans did not play Real (or Royal) Madrid on this tour, as is sometimes thought, although presumably the pennant of that team that the club now has in its possession was presented before one of the two games played in the Spanish capital. Neither did the Swans play Celtic on this tour, as has been suggested in some books. They played Motherwell twice because that club was also on tour and the games were organised to showcase British soccer in front of Spanish audiences. The Swans then moved on to Portugal where they drew 1-1 with Lisbon (S.L. Benfica). The return home to Swansea was interrupted by a final game in Paris versus Red Star who were defeated 4-1. This match was notable, though, because it saw a ‘series of squabbles between the players which degenerated into free fights’. Clearly this was a lively affair, and it was reported that a ‘considerable portion of the crowd broke onto the pitch’. We would like to build up a full record of the Swans overseas tours so if you have any details or memories of pre-season trips abroad please send them to the site. Muchos gracias. In the 1920s training wasn’t quite what it is today. 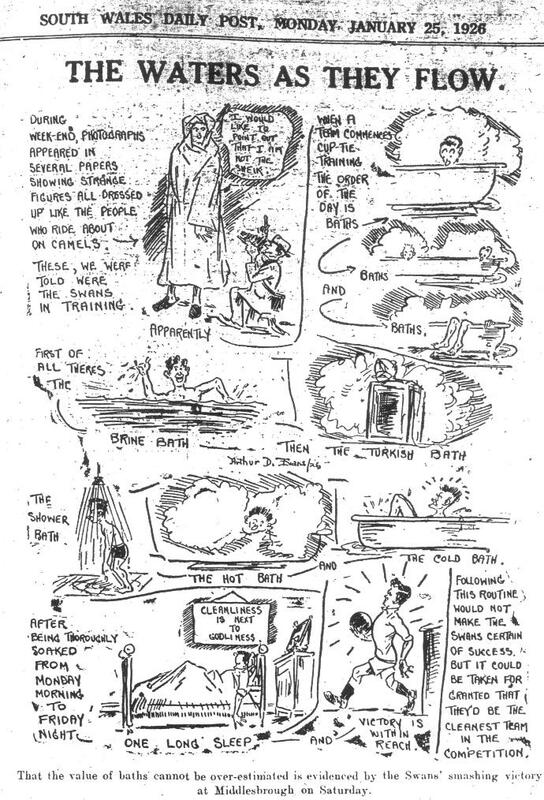 A series of different baths was considered excellent preparation for a cup tie, as this 1926 Evening Post cartoon shows. Click on it to enlarge. It was the first time I had ever been on the Swansea ground, which, I learned, was called the Vetch Field, but it might just as appropriately been styled the Cabbage Patch – for cabbages were just as plentiful as Vetches. Along one side of the field runs a covered stand, but that was all the covering, for on the opposite side and behind each goal is a mound – the only ground I know which boasts three spion kops. The turf is usually on the heavy side, but the greatest handicaps to the visitors are railings close to the touch-line which keep off the spectators, and the dip on the right wing at each end, which undoubtedly favours the home side, for they know where it is, and therefore do not have to look for it. As regards the dressing rooms, they are under the grand stand, and approached by a subterranean passage lit by lamps, but it is easier to get into the Kingdom of Heaven than into the dressing rooms, during the interval, unless you are a director. I tried to get through with a message from Joe Harris to his old colleague, Brown, who used to play for the City, but was rigorously turned back, whereat I smiled, and the smile broadened when Swansea’s 12th man for the day told me that even he was not allowed in the dressing room that day. In 1927 the whole of Swansea Town first-team refused to sign new contracts after the directors tried to lower their wages by a pound a week and make up for it by a bonus scheme based on the number of games played. The players said they were objecting to the financial harm they would suffer if they were injured. They also claimed they did not mind if they suffered financially through losing their first-team place because of form, although this was probably a sensible public statement to ensure they did not lose popular sympathy. In an act of solidarity, the first-team players who the change did not affect, because they were already on lower wages, also refused to re-sign. The players seem to have chosen their moment carefully, making their decision the week before the club was due to leave for a tour of Portugal and Spain. Yet, despite the strong position the players’ collective action put them in, they failed to secure what they wanted. The next day it was reported that many of players had signed, although it was unclear on what terms. By the following day only two players had not agreed terms. The club had held out and won. Once some of the players had broken ranks and signed, the others were vulnerable and ultimately replaceable.